*This post first ran on Sparkles and Lattes. Every spring, when the warm breezes start blowing, the flowers start blooming, and the sun starts setting a little later each night, I get the itch to trade in my usual red wine for a cold, crisp cocktail. I live in the south (I’m sure you probably already realized that from all of the y’alls that I use) and y’all (see, there it is again! ), it gets hot down here! So cold cocktails and ice cold beer are our drinks of choice during those sizzling summer months. There are tons of drink recipes on Pinterest that I’ve been wanting to try, so I took this as an opportunity to DRINK ALL THE COCKTAILS! Just kidding. But I did make one of the recipes, and you guys, I think I have a new favorite. 1/ Combine sugar, water, and strawberries in the saucepan and simmer until sugar dissolves. 2/ Pour mixture into the blender and puree until smooth. 3/ Add lemon juice, water, and vodka and mix well. 4/ Serve over ice in cocktail glasses and get drunk enjoy. This recipe makes 2 delicious servings and you’re going to want to make it over and over and over. Have you tried it? Let me know how it turns out if you do! 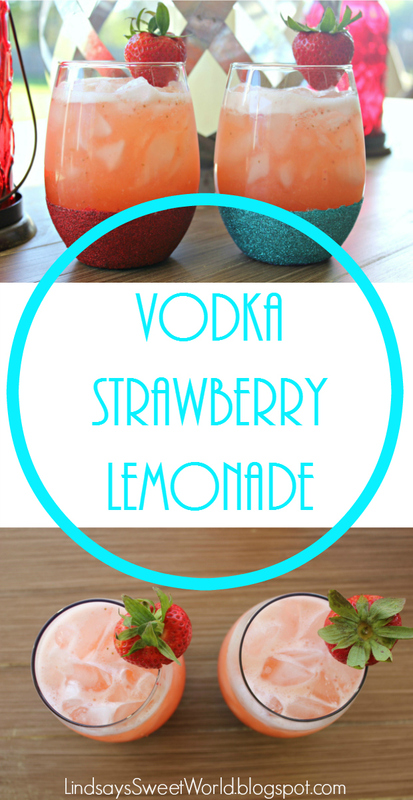 Yes, you should totally try it without the vodka. I'm sure it would still be every bit as tasty and refreshing! I remember this post on Danielle's blog and I still love it so much. I need to make these this summer. So yummy. This is definitely on my list to make this summer! This looks so darn tasty!! I might have to give these a try soon! Um YUM! I shall make this as soon as I arrive at the beach tomorrow! Why have I not made this yet?! Looks sooooo good!! DO IT! We love it! And now my momma loves it, too! I love this recipe. It is on repeat at my house and I can't wait to have friends over for dinner and share this with them. Enjoy your vacation! This looks PERFECT for a summer bbq! Thanks!